We are very grateful for this Christmas blessing and your continued support of our organization’s mission! Christmas will be here before you know it & once again we will have the Classic Crowd tradition of having the Antioch Middle School Choir to serenade us with Christmas Music! Because of the school’s early release on Thursday’s, we will have the program first and eat afterward. Make sure you are in place by 11:30 AM so you can enjoy this great program! 2:00pm: reception in the Conference Room (feel free to bring a picture of your loved one). 2:30pm: Service of Remembrance in the Chapel (feel free to bring an ornament in honor of your loved one). & bringing a toy and being a volunteer at the Store. Save the dates of December 4th, 5th & 6th. Mon., Dec. 4th Fairview will be helping to serve at Micah Ministries. We can always use more volunteers, so please feel free to check us out. We will meet at Fairview on Monday, Dec. 4th at 4:15 p.m.
Part of the dinner (turkey, mashed potatoes & gravy, & dressing) will be catered. Fairview will also provide rolls & drinks. All our Fairview family, friends & visitors are invited! The KCMMC sings concerts to benefit charities. Cost: Free Will Donation for the "Northland Christmas Store"
Proceeds from the concert will benefit the Northland Christmas Store. leave at approx. 4:30 p.m. to get there. Remember to set your clocks back Saturyday night. 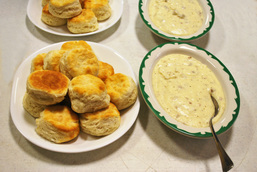 CMF monthly breakfast will start at 9:00 a.m. in the Fellowship Hall. Come join Fairview men for great food & fellowship. Tickets will be on sale this Sunday during Koffee Klatch for $6.00 per person. Kids eat free. We are having Soup, Salad and Breadsticks from Olive Garden. If you don't have money this Sunday, let us know you are coming. It will help us "guess" how much food to order. churches we've partnered with like Park Hill and NKC Christian Churches. join in the fun and we'll see you next Friday night! Fairview, once again, will be teaming up with Meadowbrook Elementary for Trunk or Treat. Trunk or Treat will be at Meadowbrook on Thursday, October 19th. More details to come. Wear your masks, decorate your trunks or come as you are! It will be a lot of fun! You need to supply your own candy to hand out. If you’re not able to participate on October 19th, but would like to donate candy to be passed out, please drop it off in the Church office by October 18th. Meal will be Loaded Baked Potato Bar plus your dishes. Entertainment will be the Cowtown Cloggers. Those participating are asked to meet at Fairview at 1pm. We will leave the church and go to the walk area. Come join the men of Fairview for great food & fellowship. We will meet at Fairview’s parking lot at 4:15 p.m.
Then we will leave by 4:45 p.m. to get there (please note this is a new departure time). In Fairview’s Fellowship Hall starting during Koffee Klatch. Back to School Supply Give Away We're partnering with Gladstone Police and Gashland UMC for a school supply give away. First Come, First Served. All that we've helped collect will be given away this Saturday (Aug. 12th) from 9-11am at Linden Square. If you can help, please let Pastor Travis know. 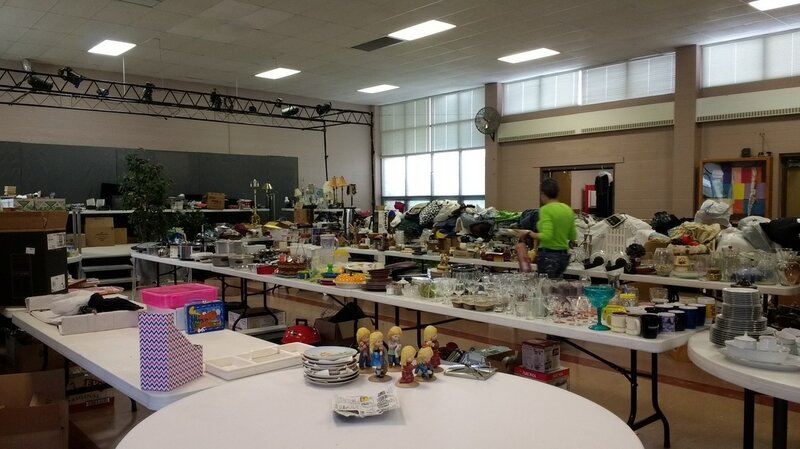 Set up is at 8, and any amount of help is appreciated. 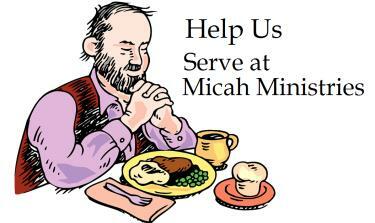 We will have back-to-back Monday’s at Micah Ministry. We will go on July 31st and then again on Monday, August 7th. So if you’ve always wanted to volunteer—here is your chance, you can go July 31st and/or Aug. 7th. We will meet at Fairview’s parking lot at 4:15p.m. on July 31st and Aug. 7th. Then we will leave Fairview's parking lot by 4:45 p.m. to get there (please note this is a new departure time). In conjunction with Park Hill Christian Church. Our entertainment will be Gary K. who performs folk music, country music, blues music & yodeling. Della Lamb Community Services Day trip is open to any one that would like to attend. We will also visit their Refugee Services Center. If you are interested in going, please contact either Kathy C., or Fairview’s office, by Sunday, July 9th to say you are planning to attend. ​We are at full capacity for this trip. Trip to the Lyceum Theater to see the show “Oklahoma” a Rodgers & Hammerstein musical which celebrates America’s pioneering spirit just after the turn of the century. Full of classical beloved tunes such as, “Oh! What A Beautiful Morning” & “People Will Say We’re In Love”. We will be enjoying a lunch at the J. Huston Tavern prior to the show. Departure time is 9:30 a.m.
Last day for reservation: Thursday, June 9, 2017. For reservations for “Blowin’ in the Wind” &/or “Oklahoma”, contact: Mildred C.
The children of Fairview also collected $130.40. 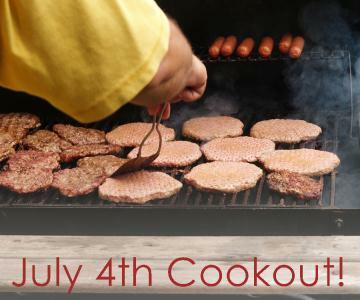 Our chef will be grilling hamburgers and hot dogs for you. Food will be cooked to order for those who like them a particular way. The rest of us will be in the Fellowship Hall -- where it is cooler. We are at full capacity for this trip. Sat., June 10, 2017 at the Chestnut Theater, Olathe, Kansas. Trip to the Chestnut Theater to see the show “Blowin’ in the Wind” a folk music show. Enjoy the timeless music of Peter, Paul & Mary, Woody Guthrie, Bob Dylan, The Limeliters, Simon & Garfunkel & many more. Before the show, we will be enjoying a chicken dinner at Stroud’s. Departure time is 11:30 a.m.; Cost is $53 per person. Last day for reservation: Thursday, May 11, 2017. For reservations for “Blowin’ in the Wind” contact: Mildred C.
Click for larger photo. Picture provided by Melissa B. All proceeds of this sale will help pay for new computers at Love Inc. Current computers are 10 years old and older. Any funds left over will be applied to client services. 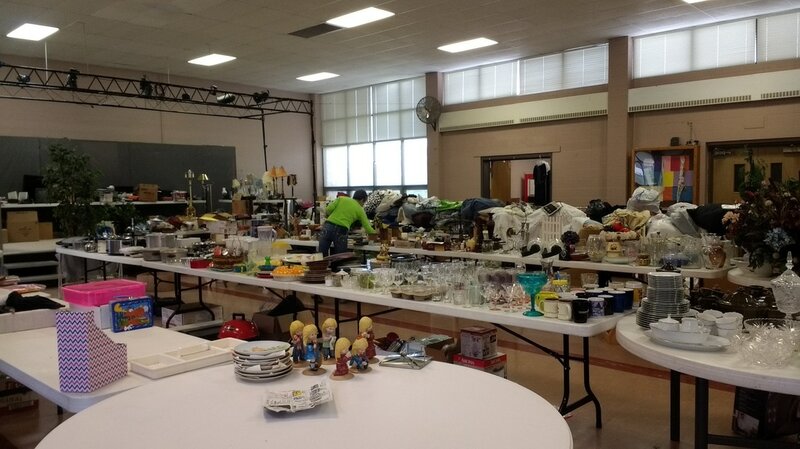 Donated items will be accepted at Fairview from May 28th forward in Fellowship Hall. 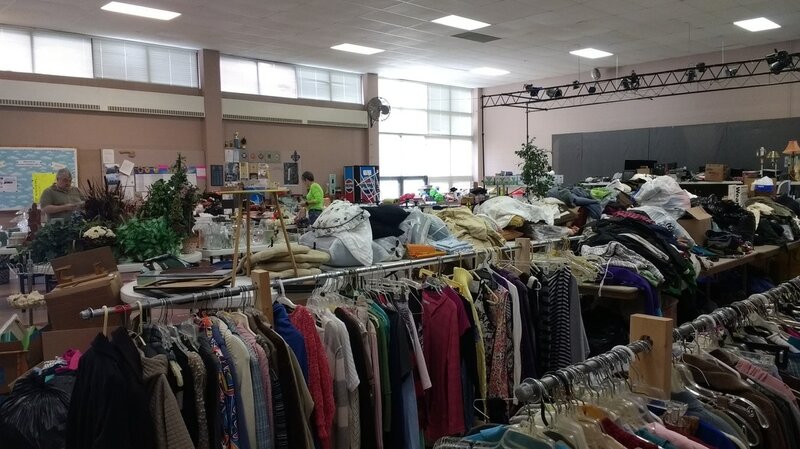 Come up and volunteer...and buy something. There is a tremendous amount of stuff to look through. See the May 24th newsletter for additional information. Please plan on attending Worship Service for this special remembrance program. Followed by going to the National Museum of Toys and Miniatures. All ladies are invited to attend & participate. 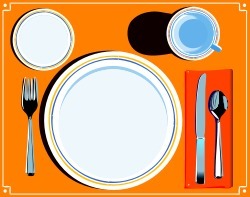 Fairview come join us for a light dinner with the GAP Kids on Wednesday, May 10 at 7:00 pm. You don't have to eat, you can just come hang out with the kids and join the fun. This will be one of their last meetings before school is out. 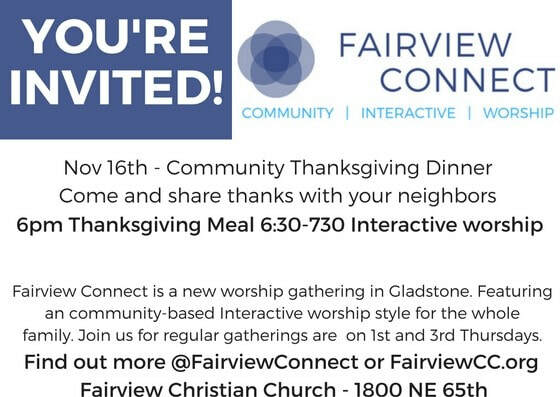 Come join the Fairview men for great food & fellowship, bring your friends & neighbors. Our GKC Regional Assembly will be held at Hillside Christian Church. Disciples will connect, family worship together with Vy Nguyen (Executive Director of Week of Compassion, experience the World Cafe model of assembly, and enjoy a dessert. Everyone is invited and encouraged to bring a dessert to share. The event is free, open to all Disciples. Click here for the regional calendar page, then click on the 2017_RA_Flier.pdf link to see more information. This link will download the pdf to your computer. In celebration of her 80th birthday, Myrna G. invites the congregation to come for lunch & have some birthday cake with her. This great celebration will be this Sunday, April 30th following Worship (during Koffee Klatch) in the Fellowship Hall. So come, enjoy food, cake & great fellowship as Myrna celebrates her 80th. The members of Priscilla are going to Henry's Tea Room in Lee's Summit on April 28th for lunch. Henry's is located in downtown Lee's Summit in a historic church. Antiques and collectibles are located on the upper level with the tea room located on the lower. Our reservation is for 11:30. Cost would be approximately $20.00-$22.00 including tip. Henry's was given an approximate number for the reservation but this needs to be confirmed so if you are going to attend please contact Sandy A. by March 27th. This event will be hosted by Fairview's Guild Group. At 6:30pm there will be dinner. The evening's entertainment will be Terry Bell, an accordionist. Tickets will be on sale during Koffee Klatch on Sunday, April 2 AND Sunday April 9th for $10.00 per person. This will be a fun evening. Invite your friends. Help us look for Peter and find some surprises! Join us for the Annual Easter Egg Hunt on the Church Lawn. This year we are partnering with our Cub Scout Pack 155 for carnival games, bike safety & bike rodeo. Flyers are available at the church to share. Saturday, April 15th at 9:00 a.m. Please help us put together the candy eggs on Tuesday, April 11th from 6:30 -7:30 p.m. at Fairview. 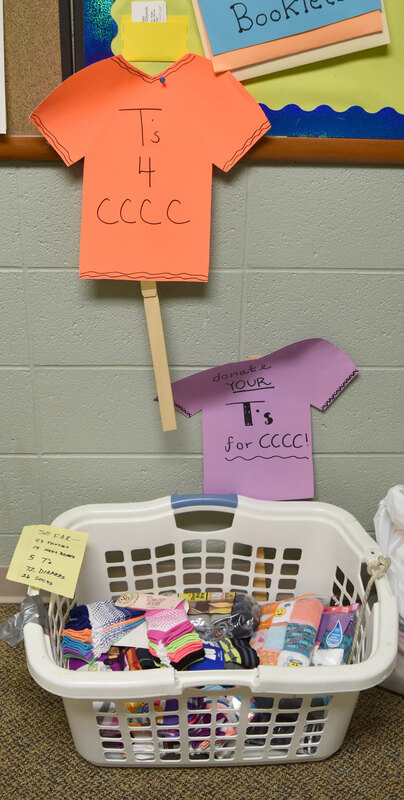 Parents: Peter needs help with Candy, Please leave Candy donations in the Church office by April 9. Fairview will be helping to serve at Micah Ministries, we will meet at Fairview on Mon., April 3rd at 4:15 p.m.
Gladstone Rotary is hosting a blood drive at Fairview in memory of John Paul. FCC Fellowship Hall; Book your appointment today at esavealifenow.org, enter Sponsor Code: JOHNPAUL. For additional details contact Bill at 816.453.1888 or scoopert@att.net. Medical eligibility questions? Call 800.688.0900. Our meal will be a great Baked Potato Bar plus your great side dishes. Our entertainment will be Melissa & Company, classic country music. The men will be going on a field trip. There will be no breakfast at Fairview in March. March 1, 2017 will be our Ash Wednesday Service at 7:00pm in the Sanctuary. We will gather to begin Lent with reflection, devotion, and repentance. Check out this video featuring Pastor Travis . This offering will be taken Sundays Feb. 19th and 26th. God is most tangibly present in this world where people hunger, thirst, lack adequate clothing & shelter, and are sick or imprisoned. Christ claims as family members who suffer. Fairview’s CMF will be selling tickets for their Annual Valentine Brunch this Sunday. Cost is $5.00 per person. Tickets on sale during Koffee Klatch or contact the church office. Any questions, please contact Tom S.
We will be having ‘Festival’ fried chicken along with all of the wonderful potluck dishes that you bring to share. Entertainment will be, Chris Foster, composer, arranger, guitarist & singer ! The final count has been talleyed and the totals are listed below. The remainder of the unsold books will be donated to local thrift shops. Fairview will be helping to serve at Micah Ministries, we will meet at Fairview on Mon., Feb. 6th at 4:15 p.m. The Troop will attend in uniform, participate and lead in worship and share what the Troop has done this year. Due to the annual Book Sale there will not be a Men's breakfast. Next scheduled breakfast will be March 4th and 9:00am. Clean out your bookshelves & bring books you would like to donate for the Priscilla Used Book Sale to the church by January 31st. Due to our inability to dispose of certain types of books, please do not bring encyclopedias. We are having our 5th Sunday Dinner on January 29th, following worship service. Please check with the office prior to arrival to make sure this event has not been postponed. If you are interested in learning to make woven mats for the homeless out of those plastic grocery bags that just seem to multiply please come. The plastic is like a tarp and keeps moisture away from blankets/sleeping bags. If you would be willing to work on this call Kathy C. or the church office. Contact the church office for further details. The meal will be ham and beans plus your delicious potluck dishes. Our entertainment will be Bob K. who performs gospel music and is a conversationalist. Mark your calendar & get the New Year off to a great start by joining Fairview CMF for our monthly breakfast event on Sat., Jan. 7th at 9:00 a.m. in the Fellowship Hall. Make a resolution to be part of a great group enjoying a hearty breakfast & great fellowship. You’ll never leave hungry or unfulfilled. If you’re a CMF regular, we look forward to seeing you on the 7th. If you haven’t yet experienced this great activity, it’s time to get motivated & join a great gathering. We will meet at Fairview on Mon., Jan. 2nd at 4:15 p.m. & leave by 4:30 p.m. to get there.